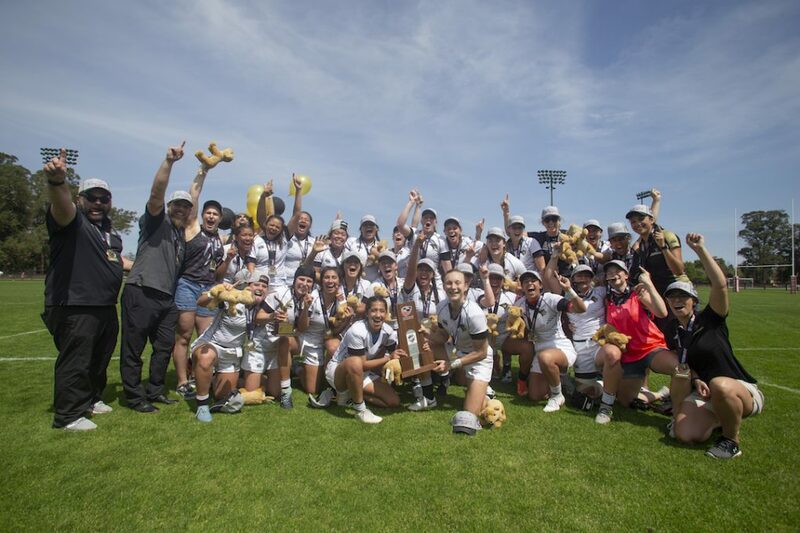 PALO ALTO, CA- Lindenwood University have repeated as Women’s D1 Elite National Champions, after beating Life University for the second consecutive year, 36-19. Teresa Bueso Gomez, after contributing a try and invaluable go forward meters from the outside center position, was named the National Championship MVP. "I'm really proud of our women and what they've done," said Billy Nicholas, Lindenwood's head coach. "The heart they've put in this year and the passion they play with." Life got off to roaring start, with their scrum half, Bridget Kahele, scoring in the fourth minute of the match. Too many infractions and loose ball handling saw Life able to play the majority of their game’s opening passage down in Lindenwood’s territory. Lindenwood, as they do so well, looked to rebound by controlling possession inching closer and closer to Life’s line. However, in a stand, reminiscent of their semifinal efforts, Life held firm- bending but refusing to break. Feeding off their defensive momentum a beautifully executed move from a mid-field scrum saw Summer Harris-Jones scream down the sideline and under the posts to extend their lead to 14. Almost immediately after, Caring De Freitas was able to exploit holes in Life’s defensive line, sending her deep into Life’s 22. Susan Adegoke provided a textbook covering tackle, but a penalty from the resulting ruck brought the score to 14-3. A bustling run from Lindenwood’s Mary Healy, again exposed the middle of Life’s defense, but lacking the finishing speed needed, Life were able to recover. However, a combination of Life’s scramble defense not being quick enough and Lindenwood’s propensity to swing the ball wide, led to a try to Lindenwood’s Sativa Tarau-Peehikuru crossing over to bring the game within eight points. Tarau-Peehikuru kept busy, as it only took a further three minutes before crossing for Lindenwood’s second try of the game. With the conversion attempt falling inches short, Life’s lead stood at one. Just before the teams headed into the sheds, another attacking foray for Lindenwood led to McKenzie Hawkins slotting her second penalty of the game. Lindenwood scored 16 points in just over 10 minutes, to take a two-point lead into the second half. After the match, Bueso Gomez said the key to their first half turnaround was their ability to get the little things right. "We just focused on the simple things, because we know if we master the little things, we're able to do everything," Bueso Gomez said. Despite an early yellow card to Summer Harris-Jones, Life showed the resiliency that has been a hallmark of their season and stormed back into the lead. Scoring the try, from a scintillating run, was their explosive fullback Susan Adegoke. Moments into the second half and Life took 3 point lead. Desperate to take full advantage of having an extra player on the field, Lindenwood marched right back down the field and exploited space around the ruck, eventually sending their number eight, Dimeken Paogofie-Buyten over the line and reclaiming their lead, 21-19. Not long after, confusion off a Life set piece saw McKenzie Hawkins scoop the ball up and through some good support play set up camp on Life’s line. Forwards controlled the ball eventually diving over extending the lead out to seven thanks to a try from Caring De Freitas. Set piece miscommunication continued to plague Life, as they gave possession in prime attacking position away. However, their defense negated much of the damage as they continued to force Lindenwood to fight for every inch. An untimely penalty saw McKenzie Hawkins stretch the lead to 10 with 12 left on the clock. Life, desperate to get back into the contest, played some enterprising rugby, but an inability to get by the first wave of Lindenwood’s defense resulted in coughing up the ball. With just under 5 to play Teresa Bueso Gomez crossed the line extending the lead to 17. From there Life probed, but the writing was on the wall, and Lindenwood were able to celebrate their second, consecutive, Women’s D1 Elite National Championship.